Harry Shum Jr. is a big winner these days! The Shadowhunters: The Mortal Instruments actor took home the 2018 E! People's Choice Award for Male TV Star of 2018 and was a part of the cast effort to win both Bingeworthy Show of 2018 and Show of 2018 for the Freeform fantasy series during Sunday night's broadcast. In addition to celebrating his three PCAs trophies—his co-star Katherine McNamara took home the Female TV Star of 2018 award taking Shadowhunters total up to four awards for the night—Shum has some personal news that he's been shouting from the rooftop this past weekend as well. The actor and his wife Shelby Rabara are expecting their first child together! The happy couple, who wed in 2015 in Costa Rica, announced the news on Sunday morning on social media and after making their red carpet debut as newly expecting parents at the PCAs Shum couldn't help but gush about his biggest role yet...becoming a father! "That wasn't a surprise. I was like, 'OK, cool, let's do this.' I don't know how other people who are expecting right now are [feeling]. It doesn't fully feel real yet, but, you start seeing the bump and you're like, this is becoming really real," Shum exclusively told E! News on the PCAs red carpet on Sunday. "I'm excited for her and for us. We haven't even planned out the baby room, none of that. We're just excited that we're about to have a baby." When asked if the actor knew what he was having he quickly replied, "Yes, a baby girl!" While he still has time to plan the baby room and prepare for fatherhood, there is one thing that Shum is already planning on doing once his daughter is born...get her shoes, lots and lots of shoes. "I can't wait to dress her up. I always see those cool shoes. These shoes are so little and they're so small. They're so light. It's weird, I look at those shoes and I'm like, please everyone give me all the shoes so I can give her these cool shoes to have," he admitted. "I just love seeing them walk around and wobble in those shoes." The former Glee star also opened up about what it's like to be a part of the Crazy Rich Asians cast and its success at the box office and with fans. "Again, we knew we had something special but it really just blows us away the support and also what it's meant to a lot people watching in the audience," he told E! News. "It's more than just a film. I know that Jon Chu is always saying it's more of a movement and it's really special to be a part of it." Shum will reprise his role as Charlie Wu in the upcoming sequel and we are already counting down until that movie gets made. Until then, fans can see the 36-year-old father-to-be on Shadowhunters when it returns in 2019 for its final season. It is the show that earned him a PCAs trophy this weekend, so it's definitely worth a watch. 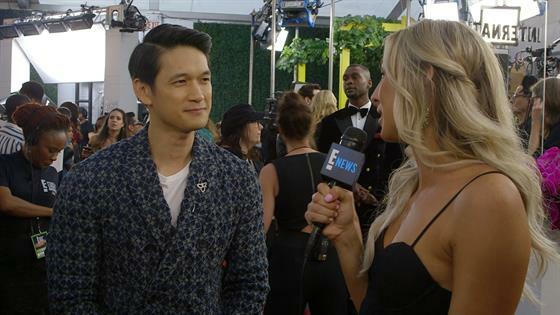 Check out Shum's acceptance speech above and check out the full list of People's Choice Awards winners here.